Methods: All patients undergoing esophageal resection are entered into a prospectively maintained database. After approval from Institutional Review Board the database was queried to extract data on patients who underwent esophagectomy for malignant disease [squamous cell carcinoma (SCC), adenocarcinoma (AC)]. Patients with benign diseases were excluded. Results: Between 2004 and 2009, 101 patients underwent esophageal resection and met inclusion criteria. There were 31 patients with BMI<25 (group A), 54 with BMI of 25-35 (group B), and 16 with BMI of >35 (group C). There was a significantly higher prevalence of diabetes mellitus in group C, hypertension in group C as compared with group A, and coronary artery disease in group C vs. B. A significantly higher proportion of patients in group C presented with Stage 1 disease than in the other two groups and a significantly higher proportion of patients in group A presented with Stage 4 disease as compared with group B. Of all patients, 28.7% (n=29) underwent minimally invasive esophagectomy, 33.7% (n=34) open transhiatal esophagectomy, and 25.7% (n=26) open transthoracic en bloc esophagectomy. Additionally, 94% of patients had gastric pull-up. More transthoracic procedures were utilized in group A than group C (10 vs. 1). There was no difference in the mean number of lymph nodes removed (14.6 vs. 17.1 vs. 17.1) or mean operative time in the three groups. Patients in group A had significantly less blood loss (p=0.03) when compared to group B but not group C. There was no significant difference in major post-operative complications including pneumonia, anastomotic leak, wound dehiscence, and recurrent laryngeal nerve injury amongst the groups. 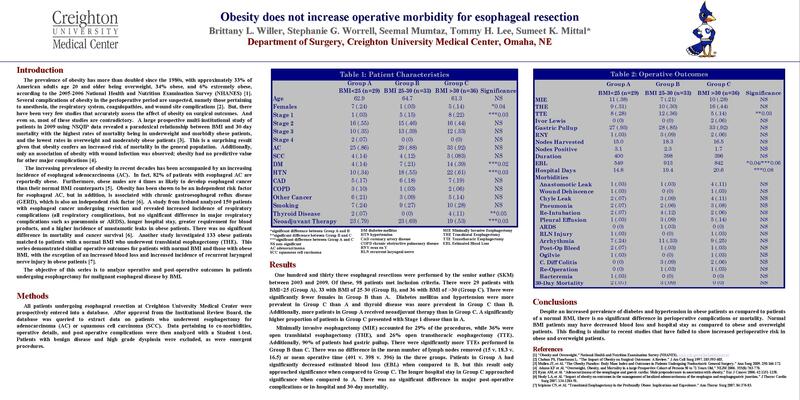 Conclusions: Obese and overweight patients undergoing esophageal resection for malignant disease do not have an increased incidence of operative or post-operative complications. However patients with normal BMI (< 25) have a significantly decreased operative blood loss following esophagectomy when compared to overweight and obese patients (BMI >25).